Find Final Four Tickets right here at SeatGeek.com! This past weekend in the elite eight round of the NCAA Tournament, Uconn edged out Arizona and #4 seed Kentucky knocked off #2 seed UNC and will now face off against one another in the Final Four Semifinals. The winner of this matchup will be the favorite in the Final Four Championship against the winner of Butler-VCU. This has been one of the craziest and most exciting tournaments in recent years. Here is a quick update on tickets for UConn vs. Kentucky this Saturday at Reliant Stadium. 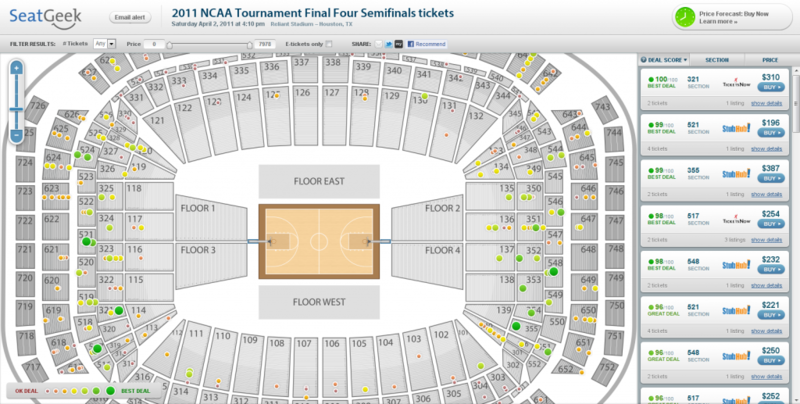 Final Four Ticket Prices: Average ticket listing price is $719, with 600 Level tickets averaging +$200!